An owner should implement a procurement plan that enhances collaboration and other benefits of design-build and is in harmony with the reasons that the owner chose the design-build delivery system. Right off the bat, this practice charges the owner with fostering a procurement plan that enhances “collaboration”: a prominent opportunity and result of Design-Build Done Right. However, the beneficial affects of collaboration do not move from opportunity to result without a determined effort on the part of the owner. Research and anecdotal evidence have long suggested that design-build project delivery is uniquely suited to help building projects achieve sustainability goals. In late 2013, the United States Green Building Council reaffirmed this when they released a new version of the Leadership in Energy and Environmental Design v4 green building rating system that includes a credit toward certification for integrative project delivery. 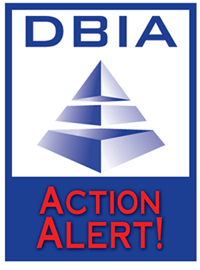 DBIA Action Alert: Write Your Senators by September 30! On July 22, Mike Simpson left his office in Valparaiso, Ind., for EPA’s Region 5 office in downtown Chicago. It’s only about 50 miles, but construction in the already congested Illinois/Indiana corridor makes the drive a nightmare. Still, it was worth it for Simpson, CEO of M.E. Simpson Co. Inc., a consulting firm that specializes in water and wastewater collection and distribution. NJIT is thrilled to be exhibiting again this year at the DBIA show. Our team will be in Dallas next month to answer your questions and share information about our suite of master’s programs that are now available online. Make sure to stop by booth 223 to say hello and learn more. NJ Transit will receive $1.27 billion from the federal government for five projects that will help the agency recover from damage caused by Superstorm Sandy in 2012 and prepare for future storms, according to Governor Christie's office. The money from the Federal Transit Administration will be used for five projects that will help NJ Transit prepare for weather emergencies, including new and expanded rail yards to park trains during floods. Trucking industry lobbyists, transportation officials, equipment manufacturers and a host of other concerned businessmen and women sent a letter to Capitol Hill urging that congressmen pass a "robust" long-term highway funding bill before May of next year when funding runs out, and protesting the "devolution" of the federal-aid program. Given the sheer size of its infrastructure and growing urban population, the US has the potential of becoming the largest market for public-private partnerships (P3s) in the world, says Moody's Investors Service in its "Global P3 Landscape" report. Illinois needs more federal money to make urgent repairs to the state’s aging dams and locks, according to an Illinois Chamber of Commerce report. “Billions of dollars in coal for power plants, grain, road salt, construction material, petroleum products and chemicals are shipped to Illinois and Chicago on the waterways each year, supporting thousands of jobs in a variety of industries,” the report states. The U.S. Green Building Council has announced the recipients of the 2014 Best of Buildings awards, as selected by fellow USGBC members. The Best of Building Awards celebrate the year’s best products, projects, organizations and individuals making an impact in green building. Nominees and winners were selected exclusively by the members of USGBC, a vibrant and diverse community of nearly 13,000 of the world’s leading organizations invested in sustainability. When the physician group at Maryland Vascular Specialists was searching for a new location for its growing practice, a vacated Blockbuster store in Glen Burnie, roughly 11 miles south of Baltimore just outside the I-695 beltway, seemed like the perfect fit. At 5,000 sf, the building offered plenty of space for the practice. Its abundant windows flooded the interior with daylight, and the location was blessed with plenty of parking and easy pedestrian access. The lease rate was attractive, too. John Gresko is a Senior Project Architect at HDR. He has experience as a design architect and a technical leader. He is motivated by the challenge of complex projects, whether it is reaching toward the sky in tall buildings or the development of a building’s skin where there is the invisible interaction of light, air, and heat. Here he discusses the 10 essential habits of successful architects. When it is built, Yucca Valley’s wastewater treatment plant will use a newer technology with membranes and biological reactors. That was one of three key decisions Hi-Desert Water District directors made Wednesday, Sept. 17. They also voted to use a consultant from an engineering firm to oversee design and construction of the treatment facility. Construction work has started on a new East County Hall of Justice in Dublin, California. The East County Hall of Justice is being built adjacent to Alameda County's Santa Rita Jail on 20 acres of county-owned land. It will include two buildings, a 42,276-square-foot County building and a 146,435-square-foot court building, including a 13-courtroom courthouse. The two buildings will be joined by a 7,500 square foot common entry lobby. It will take another six months to raise the roadway of the Bayonne Bridge, the Port Authority of New York and New Jersey said, blaming the delay on last winter's unusually harsh weather. The Port Authority now says the roadway will not be raised to a new height of 215 feet above the Kill van Kull until summer 2016, after the agency originally anticipated completion of the clearance portion of the project by the end of next year. "Advance" Registration Rate for 2014 Design-Build Conference & Expo Ends Tomorrow! There is only one day left to take advantage of our “Advanced” registration rate for the upcoming 2014 Design-Build Conference & Expo! Register by tomorrow, Friday, Sept. 26, online or via PDF download and save $100 on the cost of a full conference registration. Register now!